South Africa is endowed with multiple renewable energy resources, in particular solar and wind, which were also the most prominent technologies in the recent renewables procurement windows. The coastline of approximately 3,000 km provides favorable conditions for wind power throughout the country and large areas of flat terrain with high irradiation make an ideal ground for solar power. The east coast is tropical with large wood and sugar plantations creating promising bioenergy opportunities. Although South Africa is a water scarce country, opportunities for small-scale hydropower exist and have been exploited over the years. Tidal/wave power may become an important technology in South Africa in the future, given technical potential observed along the southwest coast. 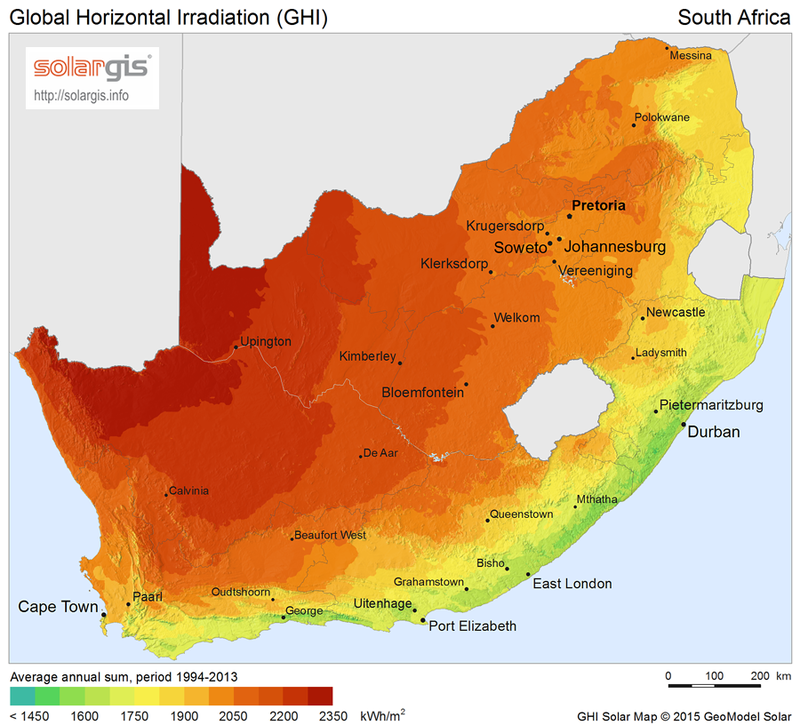 South Africa has an average of more than 2,500 hours of sunshine per year and average direct solar radiation levels range between 4.5 and 6.5 kWh/m2 per day. South Africa’s Northern Cape is one of the most attractive solar resource areas in the world. The Solar Energy Technology Roadmap (SETRM) is a joint initiative of the Department of Energy (DoE) and the Department of Science and Technology (DST) supported by CSIR, SANEDI, the International Energy Agency (IEA) and the Deutsche Gesellschaft für Internationale Zusammenarbeit (GIZ). SETRM estimated that 40 GW of Solar PV and 30GW of CSP can be developed in South Africa by 2050. Currently contracted capacity, anticipated to be installed by 2021, amounts to 2,321 MW for solar PV and 600 MW for CSP. The IRP 2016 envisions 17,600 MW of CSP and solar PV generation by 2050, in addition to the already contracted capacity. The solar PV rooftop market has been steadily growing without much Government support. A voluntary database of small-scale rooftop Solar PV installations suggests that by May 2015, these installations had reached a total of about 43.8MW. A majority of these Solar PV installations are in the commercial, agriculture, industrial and mining sectors. This is an area that still requires policy refinement at a national level. The combined commercial, industrial and residential installations of rooftop PV in the country is estimated to be between 3.5GW and 11.6GW by 2035. The Department of Energy (DoE), with international support, developed the Wind Atlas for South Africa (WASA I), which shows fair potential for wind energy in the coastal areas and inland. WASA II currently ongoing covers the remaining areas of the Eastern Cape, KwaZulu-Natal and Free State provinces. Wind power potential is generally good along the entire coast, with certain areas, such as the coastal promontories, showing strong potential. Inland areas noted with moderate potential, include the Eastern Highveld Plateau, the Drakensberg foothills in the Eastern Cape and KwaZulu-Natal. So far 3,366 MW of wind power has been contracted to be implemented by 2022. The IRP 2016 envisions 37,400 MW of additional capacity to be installed by 2050. An estimated 247 MW potential for new small-scale Hydro development is believed to exist in the rural areas of the Eastern Cape, Free State, KwaZulu-Natal and Mpumalanga. South Africa only has an installed capacity of 38 MW. Apart from Eskom’s installed hydropower capacity and number of privately and community-owned systems, it is estimated that around 60 systems have been installed in underground mining areas. No recent study has been conducted on the full potential of hydropower in South Africa. Bagasse, bulk from logs and black liquor: Being a semi-arid country, the availability of bioenergy feedstock in South Africa is limited. However, the main sources of potential biomass utilization are wood waste (generated in the commercial forestry industry) and bagasse (generated in the sugar industry). Biomass is used commercially in the pulp and paper mills, and in sugar refineries where bulk from logs, black liquor (residue from paper production) and bagasse are burned to produce process heat and generate electricity. The forestry sector produces a substantial amount of wood waste that is a potentially large resource for sustainable charcoal, gasification, or direct generation of power. There is high potential for the production of biofuels from energy crops such as sugarcane, sugar beet, sunflowers and canola. However, the low energy density of these food crops makes it uneconomical to transport over long distances and hence they need to be used either close to where they are produced, or condensed for more economical transport. South Africa disposes of almost all of its refuse in landfill sites. It has been estimated that the total domestic and industrial refuse has an energy content of about 11.000 GWh per annum. This could be directly incinerated or converted into biogas and methane to produce electricity. There have been proposals for such schemes, and several landfill sites already produce electricity, including: the Durban Landfill-Gas-to-Electricity Project, Mariannhill and La Mercy Landfills, Ekurhuleni Landfill Gas Recovery Project, New England Landfill Gas to Energy Project, Alton Landfill Gas to Electricity Project, Nelson Mandela Bay Metropolitan Landfill, and the EnviroServ Chloorkop Landfill Gas Recovery Project. A national Biomass Atlas is currently being prepared and should provide more detailed information on biomass potential. 51.5 MW of biomass power plants have been contracted so far and will be implemented by 2022. Detailed assessment of the spatial distribution of wave power off the southwest coast has been recently conducted. It was found that the average deep-sea resource ranges from 33 kW/m to 41 kW/m.